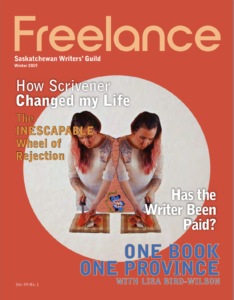 This is my latest “Space-Time Continuum” column for the Saskatchewan Writers Guild‘s news magazine Freelance. Have you ever asked yourself why you write? Or asked your writer friends why they write? I have. In fact, I literallyasked myself that question in one episode of my ongoing podcast, The Worldshapers (www.theworldshapers.com), featuring conversations with science fiction and fantasy authors about the creative process. Back in September, I had my pseudonym E.C. Blake step in as guest host (he has a southern accent, otherwise we sound remarkably similar), and ask me the same questions I ask of my other guests. If, on the other hand, you prefer an evolutionary explanation, we are creative because there is a survival benefit to it: thinking up new ways to do things may make the difference between living long enough to reproduce or dying young. Our ancestors survived because they were creative, and that creativity has been handed down. On a personal level, though, I said (and still say) that I write mainly because it’s fun. After all, most writers start as kids, and what do kids do? They play. Writers go from building sandcastles in sandboxes to building castles in fantasy realms. Yes, writing professionally is work…but at heart, it’s play. “What it means to be human” is also something many writers say they are trying to communicate. We don’t really know anybody, Card says: even our parents are capable of shocking us by doing something we couldn’t imagine them doing until the moment they do it.